The name Costa Tropical translates as "Tropical Beach". It is located in the province of Granada in the autonomous region of Andalusia and is the warmest region in Europe with a unique climate. Real estate in Costa Tropical - an interesting offer on the territory of the prestigious Spanish. High mountain peaks are protecting the coast from the cold wind, creating a special environment that allows growing of rare species of plants and exotic fruits, including mango, avocado and guava. The average temperature in January is 20 degrees, and in summer it usually does not rise above 32. But these are not all the advantages offered by the presence of nearby mountains. Closely is located the most popular ski resort in the Sierra Nevada – that allows you to move from winter to summer within a day. Our own house in a place like this - this is the dream of many foreigners. It is nice to live there and the rental is profitable. The resort town of Salobrena is located 100 kilometers from Africa and its history goes back for 6000 years! The historical part of the city has retained over time the appearance of the Arab period. One of the towers of the defensive fortress survives to this day. 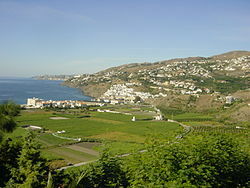 Another famous resort is Motril – located two kilometers from the Mediterranean coast. On the shore - luxury hotels and beaches with all kinds of entertainment. The city is famous for its vineyards and cuisine. Many excursions to interesting places nearby will not let you get bored. The most visited resort on the coast - Almunecar. Africa and the Sierra Nevada Mountains are located nearby. The resort offers the best water park, a bird park and botanical garden with a unique collection of vegetation and the richest collection of trees in Spain. Most of the great beaches of this beautiful city are awarded the "Blue Flag" of the EU for environmental cleanliness and arrangement. The average standard apartment on the coast is about 80 thousand euro. On the bank sales that are typical for Spain, even the luxury options are sold at 50-70% below its market value. You can buy cheap real estate from the developer during the construction phase. The nice thing is the possibility for foreigners to take a loan from local banks. Property owners from non-EU countries can apply for a multiple-entry Schengen visa.